Like many who aspire to become acupuncturists, Kristina Middleton was very keen to gain a rounded education. As well as acupuncture itself, she wanted her learning to be underpinned by an appreciation of the Chinese culture and language that are so integral to it. “The course is accredited by the British Acupuncture Council, and had a lot of teaching staff from China – something that not all universities can say,” says Kristina. Someone I knew who was studying on the course at LSBU recommended it to me, and it seemed to be the perfect fit for me. The close links between our BSc (Hons) Chinese Medicine: Acupunture degree and Chinese language and culture are possible thanks to the relationship between London South Bank University (LSBU) and the Confucius Institute for Traditional Chinese Medicine. The institute exists to promote Chinese language and culture to students and the local community, and delivers parts of our BSc (Hons) Chinese Medicine: Acupuncture degree, as well as offering extra opportunities to study Chinese language and culture and scholarships to visit and study in China. In addition, Kristina attributes the new clinic facility within Caxton House for providing opportunities to improve her experience of practical clinic sessions. Opportunities for cultural exchange are what Kristina thinks are the ‘best part of studying at LSBU'. She feels that learning from Chinese staff and students is giving her a greater understanding of Chinese culture, and found learning from their practical experience a valuable aspect of the course. Working with and learning from Chinese students and lecturers from Harbin University is fantastic. Kristina is already looking to the future, and is planning ahead for launching her own acupuncture business by accessing the entrepreneurial assistance and advice available at LSBU via the Spark programme. Spark is a six-month programme exclusively for current students at LSBU who want to turn their ideas into a business while they study. Students get to test out their ideas and create a viable product or service. The programme includes up to £500 funding, mentoring, office space (hot desking), legal support and access to networks. 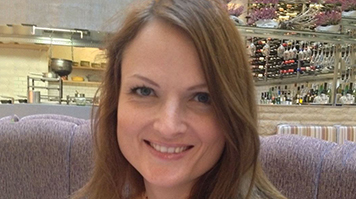 “It’s been a really useful experience and has given me lots of business advice and assistance,” says Kristina.